Scrooge winked at Oliver. “Yes, Simpson’s Tavern. 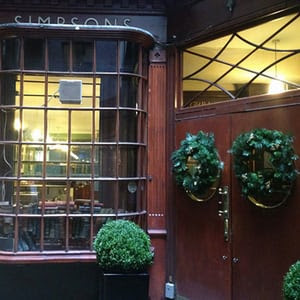 Established in 1757 by Thomas Simpson.” The door opened as Scrooge was saying this, and he took the opportunity to go inside. Oliver followed close behind. The tavern was busier than Oliver expected. Many of the booths were occupied, families gathered in small groups to enjoy a Christmas dinner without having to prepare it themselves, their chatter and laughter creating a low din against the backdrop of occasional moans from a sporadic winter wind. Scrooge found an empty booth and slid straight into it. Oliver was certain the last time he’d been in here the hanging lights over the booths had been sporting 150 watt bulbs, but this evening they were pleasantly subdued, their warmth contributing to the cozy atmosphere the tavern emitted. Oliver leaned over so that he could see around the edge of booth. The view revealed a slightly secluded booth that Oliver hadn’t seen when they first came in. Unlike most of the others this one only had a single occupant: Dottie. She was sitting alone, her face staring down at the unlit screen of her cell phone. She activated the device, looked at it for a second, then dimmed it again. She repeated this process three more times over the next fifteen seconds. The cycle was interrupted by the waiter coming over to her table. Dottie hesitated, distractedly picking up the menu as she glanced at her phone yet again. “Right away, ma’am, right away!” The waiter ambled away from her table toward the kitchen, emerging a moment later with a clear cup of something dark red and very slightly steaming. After delivering it to her table, the giant made his way to Scrooge’s and Oliver’s booth. The waiter’s greeting abruptly cut off as he got a good look at the booth’s occupants. “Oh, I’m sorry. My mistake. I… uh… My shift is just ending. I’ll send someone else over to take your order. My sincerest apologies,” he said, backing away from the table as quickly as possible, bumping into the edges of several booths along the way. At the earliest opportunity, he turned and dashed for the kitchen with an astounding fleetness of foot. Oliver stared after him for a moment, confused. Scrooge cleared his throat in that significant way, and Oliver turned his attention to him. Scrooge was staring at Oliver expectantly, then glanced at the still swinging door to the kitchen. He inclined his head toward it. Oliver finally took the hint and slid out of the booth, walking toward the kitchen. He took another glance in Dottie’s direction as he made his way across the dining room. There she sat, still alone, nursing her cup of Christmas Cheer, glancing hopefully at her cell phone between sips. He felt a familiar mix of emotions on seeing her again. He was excited and scared at the same time. He was beginning to realize that he often felt this way when challenging situations arose. He certainly felt it earlier in this adventure, when Scrooge asked him for help. He realized that he’d felt it on deciding which college to attend. He suspect that he’d been feeling it when he and Dottie broke up during the Christmas season he’d most recently visited. Setting his feelings aside, he resolutely marched into the tavern’s kitchen. The kitchen was a bustle of activity and people, most of whom bore at least some resemblance to the waiter — including the women. They were all tall, although not uniformly so, and all seemed to exhibit a cheer in doing whatever job they were at. All, that is, except for the waiter, who Oliver could see disappearing through the back door to the alley behind the pub. Several of the other workers in the kitchen shook their heads as he scuttled past them, one of them rolling his eyes. On seeing the waiter exiting, one of the chef’s helpers immediately pulled off his chef’s hat and flipped his apron around. Doing so, his stature seemed to increase a bit. He immediately looked like a waiter that Oliver had had before, a friendly and attentive fellow, although not nearly as bombastic as the waiter who’d just fled out back. The chef-turned-waiter grabbed a tray from the front of the kitchen and began pulling ready plates from the end of the prep area. He hoisted the laden tray above his shoulder and headed through the kitchen door to the restaurant without paying any attention to Oliver. Oliver followed the path through the kitchen, avoiding the people as they went about their business, and slowly opened the door to the alleyway. He found the large waiter there, squatting against the wall, smoking a cigarette. Oliver was taken aback at the abrupt change in the waiter’s demeanor. In the restaurant, he had been all graciousness and joviality. Here, he was a disagreeably unpleasant. “I’m here with Scrooge—” Oliver began. “Yeah, me and my brothers and sisters,” he replied, waving vaguely in the direction of the restaurant. “What are you all doing here?” Oliver asked, genuinely intrigued. “Well, in that case, maybe you’d consider being the rightful Christmas Spirit again? Scrooge told me that he felt like he wasn’t doing a very good job of it, after all.” Oliver looked at him hopefully. Oliver nodded, and they headed back into the tavern. The waiter got the attention of the head chef and dishwasher, and they disappeared into an office tucked away at the back of the kitchen. Oliver re-entered the dining room and was on his way back to Scrooge’s booth when he caught a high-pitched, discordant, yet endearing voice coming from one of the other booths. Taking a detour through the maze of half-walls, he found Victoria, Daphne, and his mother and father having Christmas dinner. The twins nodded and, much to Oliver’s surprise, looked genuinely sad. “It was nice to see him, even if it was a short visit,” Victoria said. “I wonder if he’s ever going to invite us to visit him?” mused Daphne. “To Oliver,” they all said together, and sipped from their cups. “Did… did you just say he’s talking with Christmas presents?” Scrooge asked, trying hard not to giggle. Scrooge went back to his booth. Oliver followed, and as he sat, glanced toward Dottie’s booth. Her cup was nearly empty, and she continued to constantly check her phone. Her face looked despondent. By this time, Oliver realized who she was waiting for, and that that person was definitely going to disappoint her. Scrooge looked over his shoulder to where she sat. “She looks lonely,” Scrooge noted. Before Oliver could reply, the waiter strolled up to their table. Scrooge scooted out of the booth so that he could stand before the waiter. The waiter’s posture seemed… different to Oliver. Straighter, less slumped somehow. Oliver saw Scrooge unfasten his ascot and unbutton the topmost buttons on his shirt. A moment later, he withdrew a silver chain, attached to which was an amulet adorned with emeralds and rubies. They flashed and sparkled, but Oliver recognized that they were in the shape of a holly wreath. Scrooge slipped the chain over his head, extending it toward the waiter. The waiter bowed low enough to allow Scrooge to slip the necklace over his head. When he straightened, his appearance had changed again. The apron had been replaced by a fur-lined green robe, the pad and pen by an empty scabbard. The amulet shone where it hung in the center of his chest, and a warmth and joy radiated from it. Oliver couldn’t help but smile at the site.